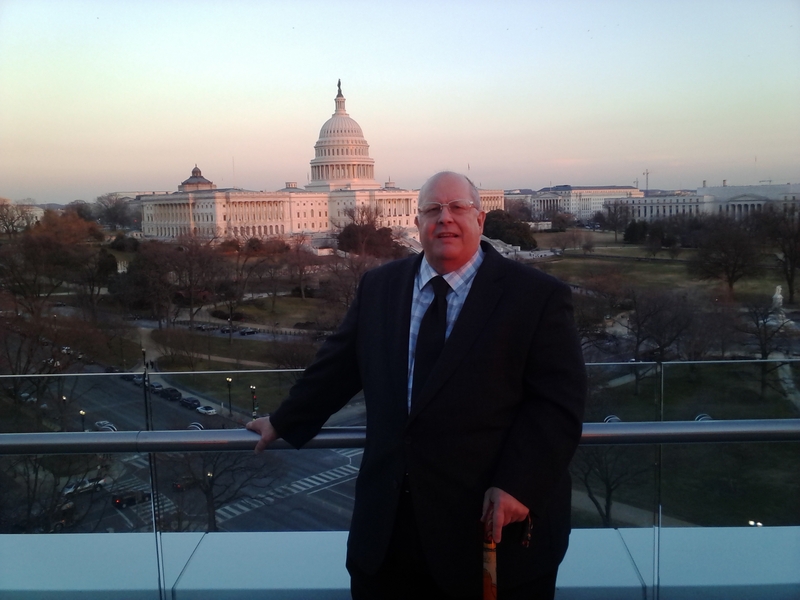 As you may know I was in DC for the Fly-in for World Kidney Day 2014. We met with Senator Cornyn’s office (Holly) and with Senator Cruz’s staff, Representative Kenny Marchant’s staffer, Representative Marc Veasey and his staff, and Representative Sam Johnson’s staffer. It was a very productive day. Busy but productive. It was my first time with Representative Veasey. Nice fellow, very bright. Kenny Marchant’s aide, Robert Vega, greeted me very graciously and said he was pleased to see me again. In fact, when he saw on his schedule that it was me again, he was excited and looking forward to my visit. I really appreciate that because, as you can imagine, he sees lots of people every week and for him to remember me and the purpose of my visit makes it especially rewarding. The other two members of the group were Tonia and Erin. Tonia is a regional manager with Davita and Erin is the Legislative Affairs person for DavitaRX (the prescription group). Tonia was great and pushed my wheelchair for most of the day. To reiterate the previous days’ events… We had a great time! The first day was long. It started out at 4am. I didn’t bother sleeping that night and had had insomnia the night before so I was running on about 3 hours sleep when I left for the airport. Parked the car… the two rows of Handicapped parking was completely full. Dragged my luggage to the waiting building where the airport buses were to pick me up, waited for the bus, and finally got to the Terminal. This time I flew JetBlue for the first time. It was very nice. Great seats, two-by-two in an Embraer Jet. The seats were 18.5 inch versus the usual 17-17.5. That extra inch or so makes a big difference. It’s only a 100 passenger jet but comfortable in that configuration. If it was any other airline, they would have a three-two config and an even narrower aisle to carry about fifteen more people. They also had out a nice sized bag of snacks, not the pint-size bag with less than one serving. And, they will give you a couple or several if you ask. The pretzels I took were good. I tried the Blue Chips that are exclusive to Jet Blue (Get the connection?). They are “potato slices” (rather than potato chips) and they were as expected… potato slices. Very potato-y. I can’t have them due to high potassium and sodium so I just tasted them. Good. The service was good to excellent. It was only less than excellent because for part of the trip, one of the flight attendants was sorta snooty. I don’t know why. The route was somewhat out-of-the-way. I flew from DFW to Boston, then to DC. I may have slept for a bit on the first leg of the trip. I really don’t recall. I was extremely exhausted. In Boston, I had to change planes but onto another JetBlue Embraer jet. On this leg my seat partner was a Freshman from a boarding school in Virginia. It’s in a league with boarding school I attended so we had a lot in common. It reminded me of my first year and all the plane travel I did in the first 15 years of my life. I felt for a moment like I was talking to myself from 40 years ago. I hope I had a similar impression on others as this kid had on me. He was extremely respectful, polite, and conversant. I learned as much from him as I hope he did from me. Anyway, it was a great conversation and made the trip much faster. I was too tired to sleep. Finally we got to DC at 2pm. Almost 12 hours after I began that day and there was much more to get done that day. I got to the hotel with just a bit of time to relax before I had a telephone conference with the National Kidney Foundation about the mentoring program. Fortunately that got postponed to another time. I’m not sure I would have been conscious enough to take it all in. I needed to get ready for a black-tie dinner that evening. It was at 101 Constitution Ave on the roof terrace and, as fate would have it, it was an absolutely beautiful 70 degree evening with a nice red-yellow sunset that highlighted to US Capitol and we had that view in all it’s spectacular wonder. It was stunning! I shot pics like a Japanese tourist as did everyone in the group. The dinner was spectacular with Surf and Turf. There’s nothing like a perfectly prepared steak and lobster! The steak was so tender you could cut it with a fork! Okay, not that tender but almost. It was shockingly good. The company was good too. A younger couple, Christie and Paul were at my table. Lovebirds. They are recently engaged. She’s not always in good health and amazingly was recently in a coma that the doctors figured she wouldn’t recover from. Surprise! She did. I didn’t think I would make it through the dinner but the excitement of the evening and the wonderful presentations made it possible. My first day there was long as I wrote about previously. But the second day began with dialysis at 4am. The previous night ended late after the DPC Education Center Gala dinner party. Nancy Scott, the Chairperson, was previously the Chair of the Board for DPC but got a transplant so she had to step down. That’s when she took up that position and is doing a great job of getting it off the ground. She’s perfect for the job, a self-driven, determined person. Anyway, I didn’t get much sleep that night before I had to be up for dialysis at four in the morning. The center we went to was an older place in the north part of DC. It sorta looked like a homeless shelter from the outside but warm and inviting once inside. Of course, they had trouble sticking me. I’ve gotten used to that fact. I told the tech she needed to use a long, 1.5 inch, needle for the upper part of my arm but she ignored me. After several failed attempts and tears were beginning to show in my eyes, she gave up and said, “You weren’t lying. That really is deep.” I thought, “Duh! Why would I lie?” That’s when she confessed they didn’t have any long needles. So she moved down on the arm and stuck me there. Once I got accustomed to the new surroundings, I was out like a light. It’s the first time I’ve slept for all but about 30 minutes of a dialysis session. Suffice to say, it was the first time I had a chance to sleep since Monday night and this was Wednesday morning! We got back to the hotel about 11am in time for lunch which was good because I didn’t eat much in dialysis. Had lunch, then we went into our briefing session. As with previous years, it was very well done. Except before this fly-in, the big issue was a change to Medicare Drugs for Transplant patients. They didn’t give us a chance and withdrew the proposed change a couple days before we arrived. So, we had a slight change of plans and worked on some other issues instead. This time it was some omnibus Kidney Legislation that will cure and fix some problems in the community. Also, we are trying to get Medicare to change its rule on dialysis patients being excluded from some Medicare Advantage plans. And, as always, we are encouraging legislators to visit our centers and join the Kidney Caucus in Congress. We didn’t get much sleep that evening because we had to be up at 6am for the day on Capitol Hill. Thursday was a blur of activity. 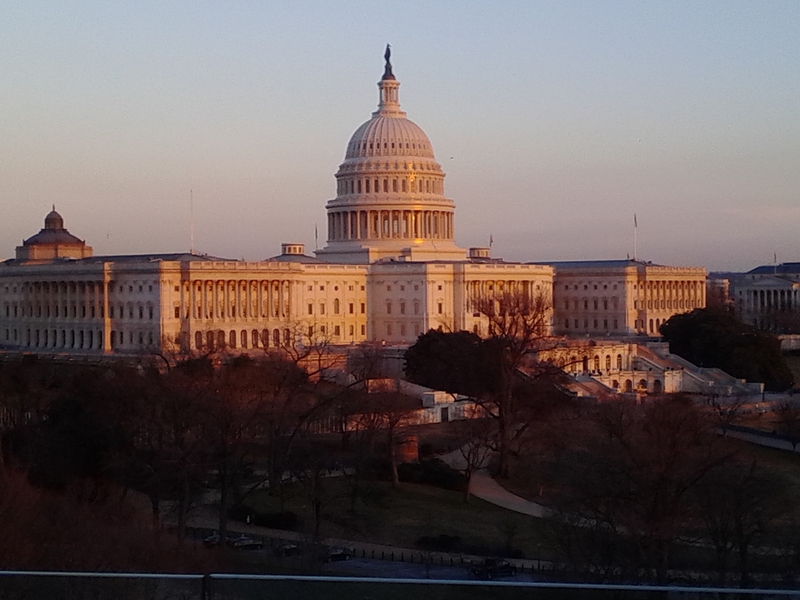 It was officially World Kidney Day 2014 and the day we met with our members of Congress. The day started early with breakfast at 6am and onto the bus at 8am to head for the meetings in Capitol Hill. But first was the obligatory photo of the group with the Capitol in the background. As we left the bus, we were met with an icy wind that was strong enough to move a horse. I anticipated some cold so I carried a heavy jacket with me. I learned from the last time, March 2013, when it was biting cold, too. However, I didn’t have gloves and my fingers felt like they were going to drop off and shatter on the ground. The rest of our last day was spent going from office to office in a mad rush and catching a quick lunch in the very busy cafeteria under the House office buildings. More about the particulars of the office visits in another post. I had a late (8pm) flight out so I had some time to spare. I went back to the hotel for paperwork and reporting. Then I spent a couple hours at the airport. I was in a wheelchair so I got priority boarding. I was the second person on the plane. It was American Airlines so it was barely tolerable. If by “tolerable” you mean “waterboarding is a viable comparison”. I bumped elbows with the poor soul that was stuck in the middle of the the three-and-three seating in an ancient MD-80 for 3.5 hours! I read a few years back that AA was replacing all those antiques with new planes. I guess not. Well, at least I got to fly JetBlue one-way to enjoy a little bit of what air travel should be. It’s been a few weeks now. I think I’m recovered. This entry was posted in CMS, dialysis, Dialysis Patient Citizens, disability, ESRD, kidney, lobbying, Medicare, National Kidney Foundation. NKF, patient care, politics, social networking, thoughts, World Kidney Day and tagged CMS, dialysis, Dialysis Patient Citizens, DPC, ESRD, hemodialysis, lobbying, Medicare. Bookmark the permalink.